Ufone is a smart cellular company offering services at the best economical rates. You can enjoy working on the internet in a thrilling way by switching onto any package among daily, weekly or monthly packages. The lovers of social networks always need an internet connection because they have to share many aspects of their life with friends and for this, mobile phone comes rally handy. So, activate any of the internet packages after reading below details and thrill your internet experience. This is one of the handsome offers by Ufone and the company has done a great job by offering the lowest rate for this internet package. There are no daily charges, no subscription charges just activate this hourly package and surf the web with unlimited amount of data. Following are the details of this handsome offer by Ufone. You are given unlimited amount of internet data to be surfed within an hour. Charges are Rs.1 for this hourly internet package. For subscription, you can send “sub” to 7808. This package makes your internet experience a real special practice, as there are so many features to rejoice with it. You are charged with minimum rates per day while the offered MB units are many. The time frame is also designed to make your leisurely moments a real joyful time. Check out the details of this package and follow the procedure to activate it on your Ufone network. You can use 100MB of mobile internet data after subscription. Charges will be Rs.4.99 per day. This package is active from 1am to 9pm. To subscribe, you can send an SMS to the code 810 with a text of “sub”. This package is backed with an auto subscription process on each day unless there is sufficient balance in your SIM card. You can un-subscribe to this daily internet package by sending “unsub” to a code of 7810. This package can be availed by prepaid Ufone customers only. Ufone brings another exciting internet package for its valued customers. They can activate this unlimited package at any time and their account will be deducted as per hour rate. This package suits your needs as you can activate it only when you are in need of using internet. No restrictions of MB units, no restriction of time, switch onto this package and enjoy Ufone’s blistering service. Following details will be helpful for you. You can surf unlimited amount of internet data after subscription to this hourly package. Charges are Rs.5 that will be deducted weekly and per hour charges of using internet are Rs.15 inclusive of taxes. To subscribe to this package, send “sub” to 806. Un-subscription to this package can be made by sending “unsub” to 9806. Un-subscription SMS will be charged at the rate of Rs.1 plus taxes. This package is also valid for all prepaid customers. This is another daily Internet Package by Ufone and quite logical one with its offered features. At this package, you are allowed to surf the web with plenty of data units while minimum charges will be deducted from your account. The details of charges and activation process are as follows. Your account is loaded with 200 MB of internet data, which can be utilized within a day. Charges will be Rs.10 and these will be deducted at the time of subscription. To subscribe to daily mobile internet package, send “sub” to 804. To unsubscribe, send “unsub” to 8804. All prepaid customers of Ufone can activate this package on any commercial call package. Details can be availed by sending “info” to 800. This one is an old package and it is not an attractive one. Prepaid Mobile Internet 5 package sanctions very low amount of internet data while the validity period is so long. You can check its details in below lines. Subscriber can only use 5MB internet data for 15 days. Charges are Rs. 50 inclusive of taxes for 15 days. Subscription to this package can be made through sending an SMS to 801 with “sub”. To check the remaining amount of data and date/time of expiry of this package, dial *706#. This inquiry will be charged at the rate of Rs.0.50 plus taxes. Prepaid Mobile Internet 30 is a monthly package and it is also an unattractive mobile internet offer. You are allowed to surf the web for a whole month but the amount of data may be expired if internet is used intensely. If you are not a usual user of internet and require few clicks to sort out the required information from web, this package will suit you. Check out the details regarding charges and subscription process. After subscription to this package, you can use 30 MB of mobile internet units as the name specifies. You account will be deducted for Rs.150 inclusive of taxes. Validity of this package is 30 days. To subscribe, you can send an SMS to 802 with “sub”. This package is also valid only on prepaid Ufone numbers. The internet offers of Ufone go on with this prepaid mobile internet package. This is also a monthly package and using internet becomes a real joy when Ufone customers activate it on their mobile phones. Check out the amazing details of this Mobile Internet Package and have a great time on internet with Ufone. You can surf the internet for 2GB data valid for one whole month. Charges are Rs.200 inclusive of taxes. Subscribe to this package by sending “sub” to 7807. Get details of remaining units of MBs by dialing *706# from your mobile phone. After expiry of period or usage of given internet data, you are charged for Rs.15 per MB. This package is also valid only for Ufone prepaid customers. 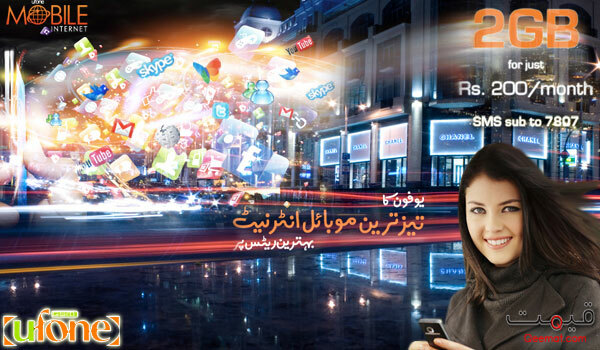 Prepaid Mobile Internet Unlimited is a wonderful offer by Ufone. This monthly unlimited mobile internet package is a mean to rejoice the internet facilities in a passionate way. You are provided with almost unlimited amount of internet data to be surfed within a month from the date of subscription. Following details will be beneficial for you. Surf 6GB of mobile internet applications and use internet for 30 days. Charges will be Rs.500 including taxes. Subscription process is very simple. Send an SMS to 803 with “sub” and package will be activated. Seek information about your account details as how many units are left and what is the exact date/time of expiry of the package by dialing *706#. Only prepaid customers of Ufone can avail this offer. Postpaid customers are also an important part of Ufone family across Pakistan and Ufone has also offered spectacular mobile internet package for them. This is a monthly package and sanctions unlimited amount of data into the account of postpaid customer’s SIM card. Check the details of this handy offer by Ufone and enjoy all the month while surfing the internet. You are given 4GB of internet usage capacity after you have subscribed to this offer. Postpaid customers will be billed for Rs.500 for this package for one month. Subscription can be availed by sending an SMS to a short code of 805 with “sub”. After expiry of this package, standard charges will be applied as Rs.15 per MB. kindly provide laxity in Internet and Sms packages for your postpaid customers as well because at present they are very fixed.